According to a study by Bizzabo®, the majority of marketers believe that events are the most effective channel to get your message across—more so than digital advertising, email marketing and content marketing. 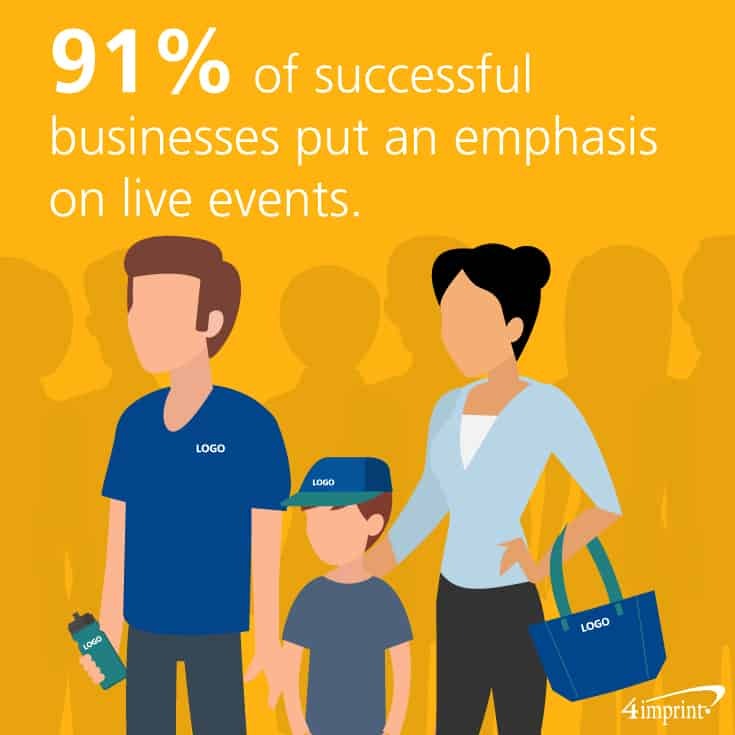 And 91 percent of businesses that are performing better than expected place a greater emphasis on live events as a marketing channel. The conclusion here is obvious: live events are a proven method of growing a business. And event swag can help! Every event your company sponsors, takes part in or hosts is an integral part of your marketing strategy. And the goal is to get people to attend—and remember—those events. This Blue Paper will walk you through some of the ways event giveaways can help create the best possible event, including stories on how companies used swag to promote an event and to make their next one better. When people think about event swag, they tend to focus on items given away at the event itself. But in reality, promotional products can be used at every stage. They can be used as reminders that an event is coming up and as a way to request feedback after an event is over. Generating buzz for your upcoming events may be a lot more critical than you think. 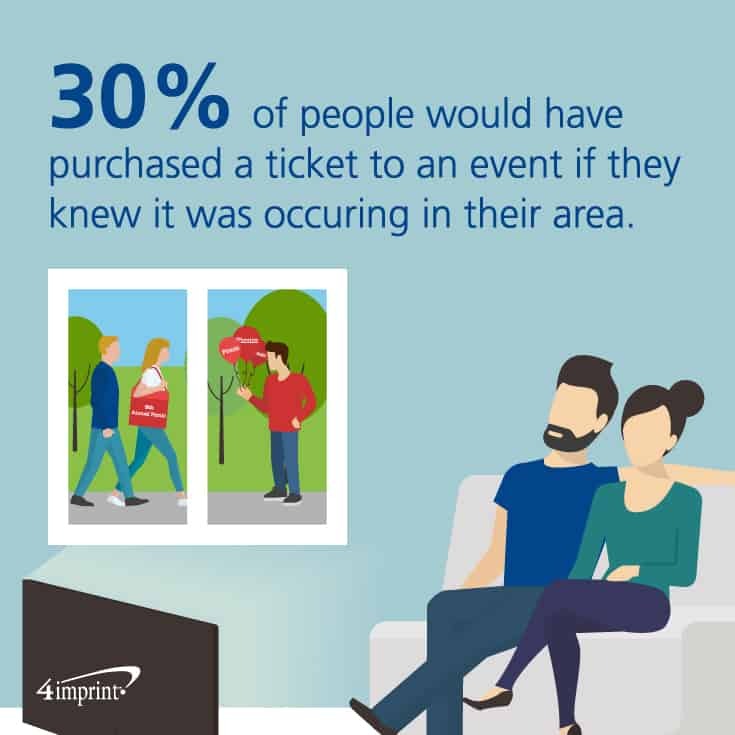 One study showed that 30 percent of people would have purchased a ticket to an event if they knew it was occurring. That’s a lot of missed connections! There are multiple ways to make sure that people aren’t missing your event. Get the word out with social media posts, email blasts and even old-fashioned direct mail. But before sealing those direct mail envelopes, slip in a promotional reminder they can keep. Include a branded full-colour sticker with a save-the-date message. Encourage your customers to attach it to their calendar. Or send a special Double Pocket Cell Phone Wallet with the date of your event imprinted on it. 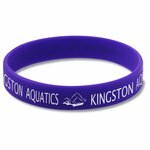 You can also use these event giveaways at other events, like trade shows and community gatherings. And many organizations that hold an annual event will give attendees a giveaway imprinted with the date of next year’s event. Studies have shown that one of the major struggles of event planning is getting people to register. Offering event swag as an incentive to sign up often encourages people. You can even add some urgency to the process by noting that the swag will only go to the first 100 people to register, for example. The Simon Fraser University Postdoctoral Association used promotional products to help increase attendance at their annual postdoc research day—a mini-conference where postdoctoral fellows present their work. “Since the postdocs aren’t considered students or staff by the university, they fall into a grey area,” said Roger Ashmus, postdoctoral research fellow. “So, we hold the conferences for postdocs to present their work. It lets them get their work out, get it known. And it gets staff from the university to see the work, along with other postdocs and students. “This year we decided to use registration items, including a USB Swing Drive, to increase attendance for the event. It worked! We managed to increase our registration from the previous year,” Ashmus said. The promotional products even came in handy during the seminar. “I saw some of the presenters squeezing the stress balls during their presentations,” Ashmus said. Many events contain a training or educational component, whether it’s a series of presentations at a trade show or a company training day designed to keep employees on the same page about new processes, procedures and price lists. Since these educational gatherings can pack a great deal of information into a short time span, the most useful event giveaway ideas are going to be the ones that help them get through the day and absorb all of that info. 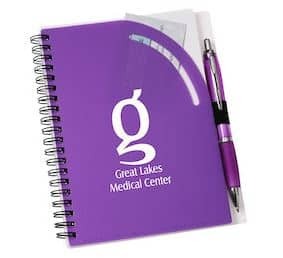 A Splash Paper Presentation Folder can be used to hold handouts, guides or other information, while a Huntington Notebook Set allows your attendees to take notes. And help keep them alert and energized with Tasty Treats – Trail Mix. 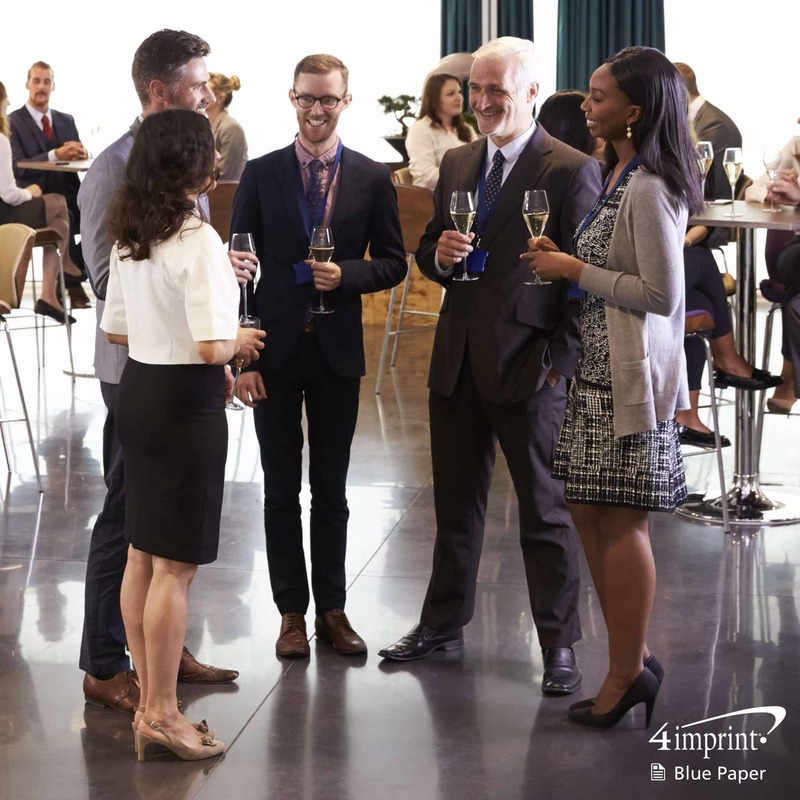 Whether you’re attending a trade show or running a booth at a community event, promotional items can be a great way to pull people to your table for a one-on-one conversation. Whether your goal is to generate sales leads, make connections or introduce a new product, getting people’s attention is key. After all, you need to catch their eye before you can start any conversation. Jen Klitzke, 4imprint’s trade show manager, offers one tip. Tigris Events also offers a fun suggestion to draw people in—host a photo booth. 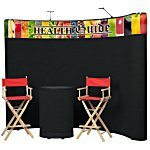 A Photo Booth Kit and an Economy Retractor Banner Display imprinted with a special hashtag can help bring people to your table—and keep you in their social media memories. You can even send people home with a Moustache on a Stick as a souvenir. 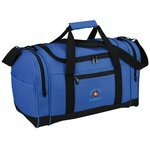 Tote bags generate more impressions than any other promo item in Canada, with more than 4,700 impressions per bag. And you’ll make an even bigger impression at the event by selecting either the biggest or best bag. That way, any other bags offered at the event will be packed inside yours for easy storage. The Fun Tote, with a top zipper and multiple pockets, even includes a key ring so their essentials stay close at hand. It’s precisely the kind of thing people will want to carry around to store the items they collect. Plus, the tote becomes a walking billboard for your brand during and after the event. It’s likely many event attendees may not be familiar with your organization. Use the items in your swag bag, or on your table, to tell them. If you recently opened a new chiropractor’s office, for example, passing out the Massage Ball can help people remember you when they need someone to soothe their pain points­—literally! As the event comes to a close and people make their way out the door, make sure one of their swag items also serves as a reminder of your brand. If you’ve held a company picnic, hand out a Cutlery Lunch Box Set to each employee. You’ll not only prevent a lot of wasted paper plates, you’ll provide everyone with an item they can use for a long time to come on camping trips, family gatherings or even while eating lunch at the office. In some ways, the end of an event is just the beginning. You’ll probably be looking to connect with possible sales leads, thank sponsors and reach out to potential donors, employees or volunteers. No matter what, a follow-up is critical. Multiple studies show that following up after an event all too often falls by the wayside. 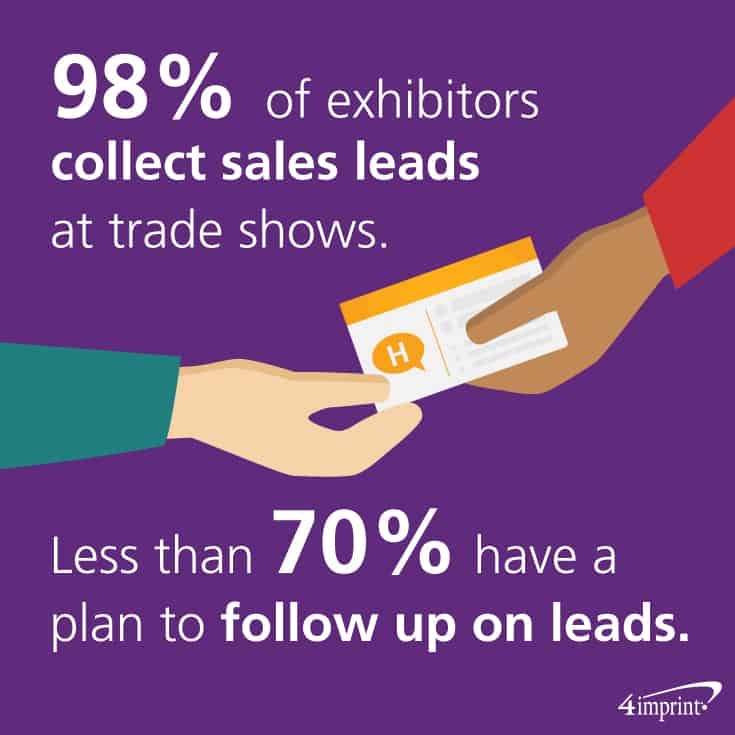 In fact, one study discovered that while 98 percent of exhibitors collect sales leads at trade shows, fewer than 70 percent had a plan in place to ensure those leads were contacted after the show. Depending on the lead, following up can mean anything from a phone call to an email offering necessary information on your products or services. But sending a follow-up gift is a more memorable way to keep your company top-of-mind. A USB Hub Desk Caddy will remind them of your brand every time they reach for a pen, charge their phone or upload files. The type of thank you should vary according to the size of a donor’s contribution. A thank-you card, like the Calling Card – Ghirardelli Chocolate, enhances a simple thank-you with a sweet treat. For major sponsors, share the love and thanks with the Prestige Collection Treat Tower – Snack n’ Share – Royal, a sweet and savoury snack that can be enjoyed by the whole team. It’s not always easy to get people to complete post-event surveys or feedback forms. But, Michelle Collins, Regional BSO Manager of Alzheimer Society of Peel in Mississauga, Ontario, found a way using event giveaways. “Every year, we gather all of our team members together to share and learn. We bring in people from the field as well as expert panelists in order to promote the exchange of information,” Collins said. “At the end of the session, we ask people to fill out a survey and provide feedback for what they wanted to see at next year’s event. We knew that people wanted different things from the gathering, but because people didn’t always fill out the feedback forms, we didn’t know what to change. “This year, we gave everyone who filled out a feedback form a water bottle, and we had 100 percent of the attendees that were there until the end of the session submit! Even a couple of people who had to leave early made sure to submit their form so that they could get their water bottle,” Collins said. Event swag can help you at every stage of event planning, from sending invitations, to making preparations, to starting conversations and beyond. No matter what kind of event you’re attending or hosting, these event giveaway ideas can help make it a little bit better. Good luck! For internal training events or trade shows, these will help people “make note" of your brand.